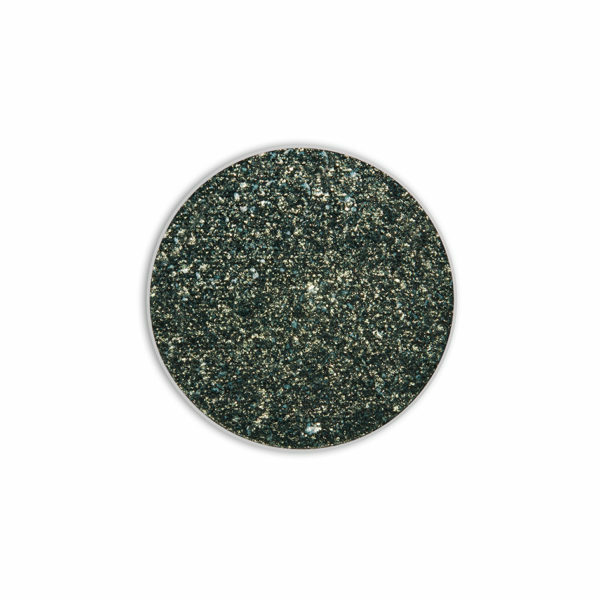 Precious and mysterious, you’ll emerge from the shadows and into the spotlight with this rich, shimmery shade of this dark green glitter eyeshadow. A little goes a long way, gradually build up coverage for maximum drama or let it be the support act to a complimentary shade for a different eyeshadow look. There are plenty of green eyeshadows to choose from, but only one can be your star. Eyeshadow Description: Cool dark green with gold shimmer. Load a small fluffy brush or a blender brush and pat the shadow onto your eyelids and blend out. This shade can be used as a highlighter and applied in the corner of each eye.